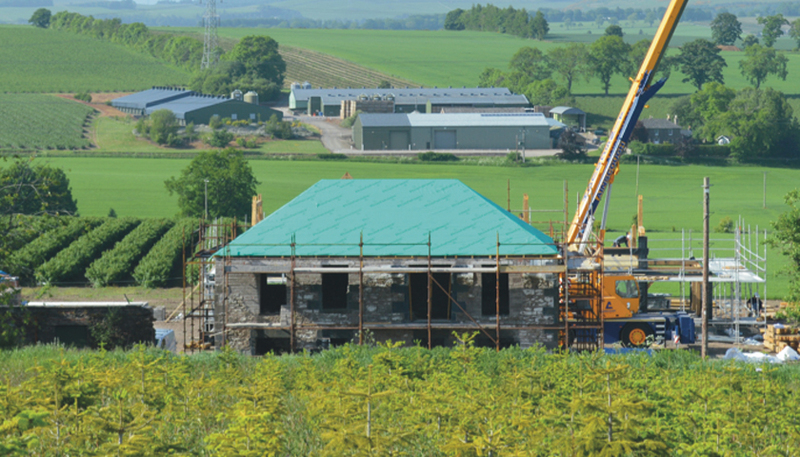 Roofshield preserves the character of historic Scottish steading with roofing membrane solutions ..
A historic farmstead conversion in Westmarch, Dundee is set to benefit from the added protection of Roofshield, which has long been recognised as one of the highest performing roofing membrane solutions, providing a pitched roof underlay, which is both air and vapour permeable. The original building comprising farm steading and offices dates back to around 1856. In 2017 the buildings were purchased by Jason Stewart of Circinn Developments Dundee with plans to convert the site into two buildings consisting of a 2-bed and 3-bed unit. Roofshield is recognised as one of the highest performing roofing membrane solutions and has become the preferred choice of architects, developers and contractors. Many vapour permeable underlays use an airtight VP film layer to achieve their performance, whilst Roofshield’s patented SMS (Spunbond Meltblown Spunbond) structure allows high levels of airflow, in addition to the transport of moisture vapour, making the formation of condensation in the roof space virtually impossible. It has an extremely high degree of vapour permeability, as well as air permeability, so will still perform in conditions in which air tight alternatives will not without the need for ventilation to the roofspace. Steadings form part of the history of the agricultural background of the country and are a legacy and connection with our past. All too often modern farmstead conversions can end up destroying any signs of the original character. In the case of the Westmarch Steading, an excellent balance has been maintained between the old and the new resulting in a traditional look and feel to the buildings. A final thought: during the conversion two old safes were discovered in the office area. Perhaps another link to the past where farm hands and labourers may well have come to receive their wages? To find out more about roofing membrane solutions by A. Proctor, please click here.